Your water heater is one of the hardest working appliances in your home. Yet it is out of sight and mind until it either stops heating water or leaks causing damage to your home. Here in Southwest Florida, you should plan on replacing your water heater when it reaches the age of ten years old. Can they last longer than this? Yes, the oldest we have seen was recently removed from a mobile home and had a date of July 1976. This is a rare case at 34 years old. Where your water heater is located will help you decide if you are going to replace it sooner or later. If your water heater is located in a 2nd floor condominium, your neighbors below you might appreciate you replacing it at ten years old or sooner. The age of your water heater is usually hidden in the serial number. 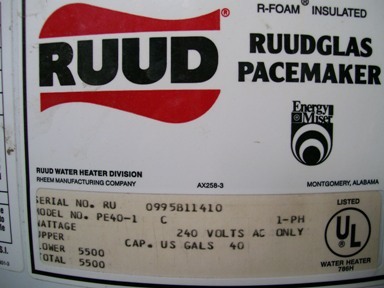 For example Rheem and Rudd electric units first 4 digits of the serial number represent two digit month and two digit year. In the picture below you can see the first four digits are 0995. 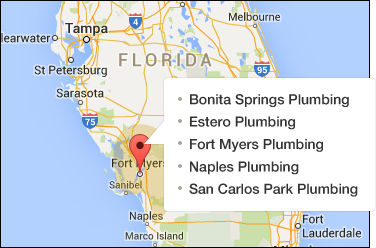 If you are in need of a water heater repair or installation in Naples, Ft Myers, Estero, Bonita Springs or San Carlos Park, FL. do not hesitate to call Moen Brothers Plumbing & Drain for a quote. Our low overhead enables us to offer a superior service at prices difficult to match. We stock all the major brands in many different sizes. If you would like an accurate quote, please look at the tag on your water heater. We will ask the size, location and type of piping to your water heater. Water heaters requiring a new shut off valve, pan or water heaters installed on second floor condos may be more. We take all factors into consideration. If your water heater is installed on a second floor condo with white carpeting all the way to the door, you may expect to pay more. This ensures we are replacing your water heater and not the carpeting too. My water works and is not leaking but I used to get a lot more hot water from it? Water heaters that are full of scale build up can literally take up the room the water used to occupy. Your 40 gallon heater may have 10 gallons of scale in it. A water heater also has a dip tube that routes cold water to the bottom and pushes the hot up and to your shower. If this tube breaks or falls apart, the cold water inlet will mix with the hot going out and affect it’s performance. Water heaters should be drained or flushed annually to prevent build up. My water heater makes a lot of noise while it is heating? This is usually a sign the heater needs to be flushed and elements replaced. My Hot water stinks, the cold is fine, just the hot? Minerals in your water may be reacting with your anode rod. The anode rod is a sacrificial piece of metal installed into the tank, the idea is the anode rod will break down protecting the tank. Usually this comes from a customer with well water but not always. They make magnesium anode rods that solve this problem. Is tank less better than conventional? Yes, tank less are more efficient in saving you electricity. Your conventional water heater maintains the temperature you want all day long while tank less heat only when you want it. A few downfalls with tank less water heaters are your electrical service usually needs upgrading , meaning you will need an electrician. Also, we don’t see repair parts everywhere like we do with conventional water heaters. We prefer to work with products that are stocked and supported by our local plumbing supply house. We will gladly install a tank less water heater if you have decided it’s right for you. We have installed countless electric, gas and tank less water heaters in Ft. Myers, Naples, Bonita Springs, Estero and San Carlos Park. Please call us for a quote, you will be glad you took the time to get a quote from us. As always we offer 100 percent no obligation free estimates. Some water heaters are best quoted in person to give you an accurate price. No bait and switch pricing here, just honest, dependable and affordable plumbing and emergency plumber services.